Startups need to have a great lawyer, accountant, patent attorney, etc. But founders need to know how to ask for their advice and when to ignore it. I was having coffee with a friend who teaches at the U.C. Berkeley Boalt Law School and runs their entrepreneurship program. Our conversation led us to Scott Walkers post Why Entrepreneurs Hate Lawyers and why we both recommend that entrepreneurs print it out and tape it to their wall. I remember when I encountered bullet #1 on Walkers list. After being in business for all of seven months, one of our first deals at Epiphany was with a software company called Visio, (now owned by Microsoft.) After some heroics from our CTO in extracting data from SAP, the Visio CFO loved our product, thought we could save them a ton of time and money and wanted it installed ASAP. We were excited that we were getting our first six-figure check and a reference customer. Then Visio gave us their boilerplate contract. We passed it to our law firm who promptly threw up all over it. The issues our lawyer had raised about the contract, while correct, were strategy questions the founders needed to answer, not legal questions. Negotiating deal points before we thought through our strategy at best would have cost us a ton of money with little progress. Looking at the Visio contract the question we were faced with was; how bad would the short term consequences be in signing the deal? The answer to that was easy – none. We’d have money in the bank and a reference customer. The next question was, how bad would the deal points Visio was asking for screw us in the long term? This was more complex. Some of them would have limited our ability to sell to other software companies. Those were clearly unacceptable. Some of their other requests were just “comfort” issues like putting the software in escrow to protect Visio in case our startup went out of business. Finally, there was a class of what I call “business development contract terms.” This happens in every company when a contract is passed around for review and everyone feels they have to mark it up with extraneous demands to feel like they had their say. Most of these points might have sounded great in law school but were impossible for a startup to deliver. My co-founder and a few board members brainstormed to make sure we weren’t missing anything. Then we got on the phone. We realized that our goal 1) was to get a deal done, 2) on terms we could live with and 3) it required talking to someone senior at Visio with the authority to make decisions on their side. Only then could we have our lawyer spend any time on the contract. We called the Visio CFO. We explained that their boilerplate contract was something we couldn’t sign because it would put us out of business. We said we would be happy to work with him in providing assurances on issues that were of importance to him and his company. We agreed to the major points in a half hour. The lawyers had the final contract done in two days. Lawyers provide a service; they are not running your company. If you find a lawyer who talks about solutions not problems, hold on to them. In every company that gives you a contract there’s someone who wants a deal. When you run into contract issues, call them first for advice. Recognize whether you have a legal problem or strategy problem. The web has great blogs by lawyers who get it. Read them. I pulled a few pranks in the military, but the one that got pulled on me took years off of my life. There isn’t anything cooler for a 19-year old then getting into the cockpit of a fighter plane. While most of my time was spent in the shop repairing electronic warfare receivers, every once in awhile I got called out to the flightline to troubleshoot a problem that couldn’t be duplicated on the bench. In the year and a half I was in Thailand I climbed in and out of the cockpits of F-4’s, F-105 Wild Weasels and A-7’s. If you worked during the day, the flightline felt like organized chaos and viewed from above it might have looked like an anthill (if it had 500lb bombs.) Planes were prepped for maintenance and had all the service equipment you needed and a crew chief nearby. But at night the flightline had a different, slower tempo. You’d catch a ride to the revetment, and you’d be out there alone watching the moths and baht bugs dance in out of the beams of the portable light carts. You’d have a “start cart” towed to the plane, lug a power cord the size of a fire hose and plug in the external power to the plane, climb the ladder, open the canopy, and get into the cockpit, turn on the aircraft circuit breakers and power up my electronic countermeasures equipment (no I never got to start the engines.) It was way cool. Even more so at night when the cockpit lighting and displays and the stars above made you realize that even a delivery vehicle of death could be beautiful. It made you forget you were sitting on top of a rocket two inches from your rear end. All military fighter and bomber aircraft are equipped with ejection seats. If the plane is damaged in combat the pilot (and crew) can escape before the plane crashes. To eject the pilot pulls a handle and the next thing he knows he’s hopefully seeing his chute above him and damaged plane spiraling into the ground. Ejection seats work on a simple principle. Underneath each of the seat(s) is a rocket designed to shoot the crewmember out of the damaged plane. The seat is mounted on rails that guide the seat out of the plane. After clearing the plane the seat then falls away and a parachute deploys to gently land the crewmember/pilot. Each type of military plane has a slightly different ejection sequence. On fighter planes they work by blowing the cockpit canopy off and then firing the rocket under the seat. On bombers they worked by blowing hatches off and then firing the crew up, or in some cases down, away from the aircraft. Each time you got to an airbase you’d get briefed on aircraft safety on the “egress” systems. Someone in your shop would take you out to an aircraft and show you where each of the pins were supposed to go and make sure you knew what not to touch, kick or remove. The accidents that happened when something did go wrong were gruesome. When I got to my first airbase in Florida they first thing they told me was, “You might want to pay attention, we scraped some airman off the hanger ceiling three months ago.” And a few months later at my base in Thailand the same thing happened again. When I came home from Thailand I was stationed on a B-52 bomber base. These 8-engine bombers carried nuclear weapons and had a crew of six in a two-story cockpit. On the upper deck the pilot and co-pilot faced forward, and right behind them sat the Electronic Warfare Officer and the Tail Gunner facing backwards. All four crewmembers had upward firing ejection seats just like the fighter planes I had worked on. But on the bottom deck sat the Navigator and the Radar Navigator (the bombardier) and their seats ejected downwards. Two of my new shop mates took me out to my first B-52 to get me “checked out.” You entered the plane from a hatch in the bottom deck and climbed a ladder to the top deck. We started on each of the four seats on top as they taught me where all the safety pins went. 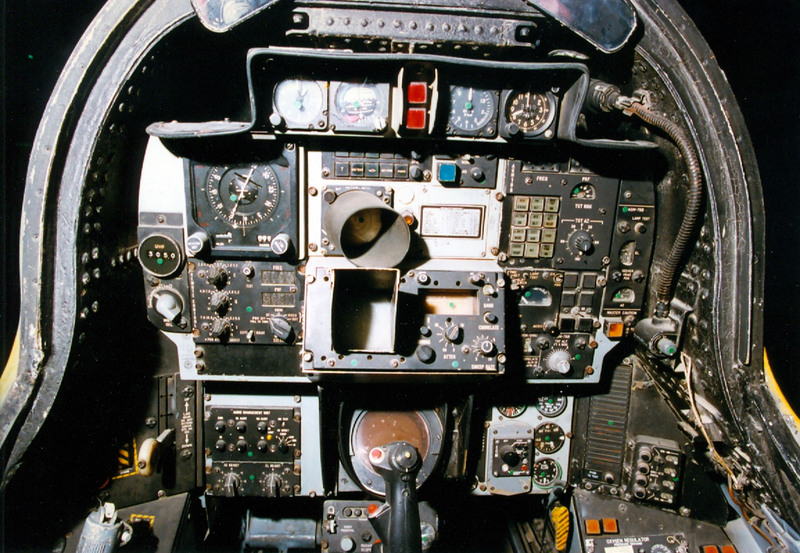 They sat me in the Navigators seat as they kept telling me more and more horrific B-52 ejection seat stories. “Yeah on these seats the ejection sequence automatically starts when it grabs your legs. The rocket fires in 10 seconds.” Sitting in the navigators seat, I was processing that when they said, “Move your legs back to get some more room.” I kicked my legs back and then heard a loud metallic noise. All of a sudden my legs couldn’t move. Something had grabbed my ankles. I closed my eyes and prepared to die. As they helped me down out of the hatch there must have been 10 more of my shop mates gathered on the tarmac. I had just been initiated as a maintenance technician on the B-52. At times VC’s forget who their business is built on. Last week in a car showroom of all places I ran into a VC who I hadn’t seen in ten years. He had sat on the board of my last company and we chatted and made small talk as he was admiring a new car. It was clear that he had no memory of a phone conversation my partner and I have never forgotten. The legendary VC was too busy to sit on our board, so we got another younger partner in his firm with seemingly the right pedigree – engineering degree, MBA, lots of boards, etc. But as we would find out the hard way – zero experience as an entrepreneur. Now that the big name CEO had tentatively accepted our job offer we were having a board meeting via conference call to approve his compensation package. My co-founder and I gulped as we went through each part of the package; the equity we were offering would make him an equal founder, and his salary, while a huge cut for him was a lot more than the starvation budget we had put ourselves on. However, the new CEO was as hungry to join a hot Internet startup and work with legendary VC and not miss the bubble, as we were in hiring him. We thought he’d be worth it. A point the young VC on our board kept reminding us of. When the call was almost over my partner and I mentioned, “We want to remind you guys that we’ve been working at founders pay for almost three years. We’d like to adjust our salaries to reflect the new pay scale.” We had hoped for parity with the new CEO, but any offer of some kind of raise would have made us feel good. Instead, what we got from the VC, was “Who the hell do you think you guys are. You’re just the founders.” Then he proceeded to give us a lecture of why we should consider ourselves lucky to get this new guy, he and his firm were the ones that were going to do the heavy lifting and we should be happy that we were going to make our money on the stock, etc. We never did get a raise. Luckily the company did go public, but I’ve never forgot the conversation. For the last 12 years as friends and then students have asked me about how to approach this big name venture firm, I’ve managed to steer them to other venture firms in the valley – by suggesting that there were firms who would treat them like they mattered. I’ve averaged about 6 referrals a year. I figure when I get to 100 I’m even. Having a VC who has been an entrepreneur is a plus, but it’s attitude that matters. If you’re a founder, ask for a pay-parity agreement with a new CEO upfront and in writing. Last week one of the schools I teach at invited me to judge a business plan contest. I suggested that they first might want to read my post on why business plans are a poor planning and execution tool for startups. They called back laughing and the invitation disappeared. At best I think business plan competitions are a waste of time. But until now I haven’t been able to articulate a framework of why or had a concrete suggestion of what to replace them with. Where did the idea that startups write business plans come from? A business plan is the execution document that large companies write when planning product-line extensions where customer, market and product features are known. The plan describes the execution strategy for addressing these “knowns.” In the early days of venture capital, investors and entrepreneurs were familiar with the format of business plans from large company and adopted it for startups. Without much thought it has been used ever since. It turns out that’s a mistake. 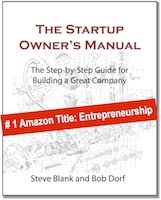 A startup is not executing a series of knowns. Most startups are facing unknown customer needs, an unknown product feature set and is an organization formed to search for a repeatable and scalable business model. That means that writing a static business plan adds no value to starting a company, as the plan does not represent the iterative nature of the search for the model. A simple way to think about it is that in a startup no business plan survives first contact with customers. Instead of business plans I have suggested that startups use business models. 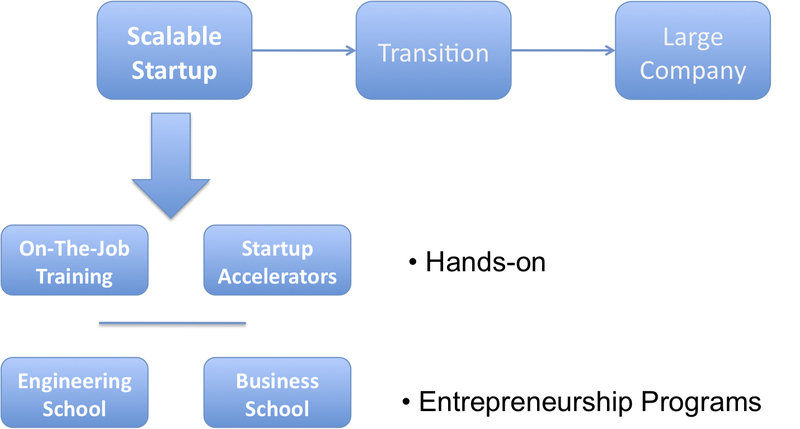 Business models are dynamic and reflect the iterative reality that startups face. Business models allow agile and opportunistic founders to keep score of the Pivots in their search for a repeatable business model. Almost every university, region and car wash now has a business plan competition; the rules, who can participate, how large the prizes and who are the judges vary by school. Business plan competitions perpetuate everything that is wrong about trying to make plans that were designed to be used in large companies fit startups. (One of my favorites: “Judging will include such factors as: Market opportunity, reward to risk, strategy, implementation plan, financing plan, etc.”) All of which may be true in large companies. But little of it is relevant to the chaos and uncertainty in the life of a startup. Yet an ever increasing number of schools keep holding Business Plan competitions. Why? They’re a match for the “How to write a business plan” classes that are offered. It makes the school appear relevant to their constituencies; students, donors, faculty, VC’s. Business plans are easy to grade, score and judge. Schools can get Venture Firms to fund prizes for the best business plan. Venture Firms use the contests as another source of deal flow and talent. The irony is that business plan competitions ought to be held for plans from large companies not for startups. Each team would be judged by their business model presentation on these five steps. 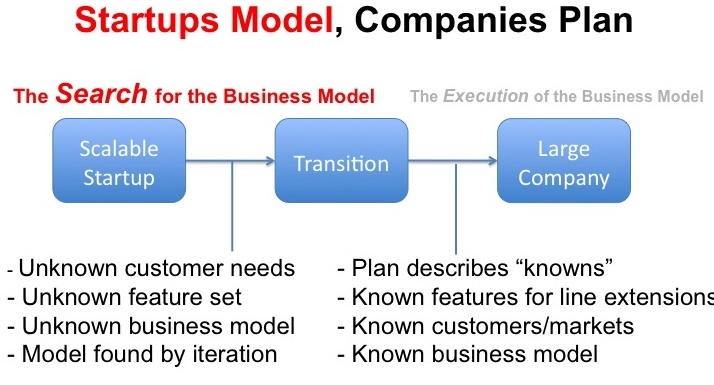 The business model would be scored and judged based on steps 3 and 4. And extra credit for multiple times through the loop. For the first time we’d have a competition that closely resembled the reality that founders face, rather than a creative writing exercise. There are now examples of business model presentations on the web. They were also at the heart of the Startup Lessons Learned conference. Consultants can help startups leverage their limited resources. But startups can shoot themselves in the foot when founders use consultants at the wrong time or in the wrong way. Here’s why. So I met the entrepreneur and asked him how his search for a business model was going. “Great, but we’re having a bit of a problem getting traction.” (Anytime I hear an entrepreneur talking in euphemisms, I get nervous.) After a bit more discussion, I discovered the “problem in getting traction” meant revenue was zero. A startup exists to search for a scalable and repeatable business model. Customer Development is the process of how you get out of the building and search for the model. Customer Development is designed so that you the founder(s) gather first hand experience about customer and market needs. Let me say it again: Getting customer feedback can not be delegated. Why? Founders get out of the building (physically or virtually) to test their hypotheses against reality. There are times when customers are going to tell you something that you don’t want to hear. Or you’re going to hear something completely unexpected or orthogonal to what you expected. Pivots need to happen quickly, rapidly and often. Consultants can not do that for you. In fact, startups that use consultants almost never pivot fast enough. Why? Because it’s easy to ignore what consultants say and remain deluded by your own passion. Couple that with consultants that can’t and don’t understand the business deeply enough to know when to pivot. You have the vision, they don’t. The breakthroughs and aha moments can be random, unpredictable—but only the founders can find and make them. Coming out of my daze, I asked: “Why weren’t you the one talking to customers?” The answer, “Well I was too busy coding and building the product. But I knew getting customer input was important so I hired this great consultant who told me all about the features customers need.“ Ouch. Using consultants as your proxy when you were supposed to be out there learning means you’re not really doing Customer Development and don’t understand the process. When Do I Use a Consultant? So should your startup ever use a consultant? Of course. Consultants can add tremendous value to your start up once you believe you have found a scalable business model – i.e. you think you have product/market fit. If your too busy coding to get out of the building yourself find a co-founder. Entrepreneurial Finishing School – Should I Get an MBA? I usually hear the “Should I get my MBA?” question at least once a month. If you’re an entrepreneur, the glib answer is “no.” It’s also the wrong answer. Last week I was having coffee with an ex engineering student of mine now on his second startup (and for a change it wasn’t a Web 2.0 startup) who wanted to chat about career choices. “I’m thinking of going back to school to get my MBA.” It was said less as a clear declaration than a question. It was six years since he had left school and three and a half years ago he had joined an 8-person startup as a product manager. The company was now 4-years old and 70+ people, profitable and growing fast. The easy answer would have been, “Yes, go back and get an MBA. You fit the perfect profile; you have an engineering background, work experience in two startups and you’ll be limited in your career growth without one.” But the answer I gave him was a bit different. I explained that as startups grow, they go from the box on the left to the box on the right and the skills people need at each step of a company’s growth evolve and change. The skills required when they were an 8-person startup trying to “search for the business model” wasn’t the same set of skills needed now that they were a 70-person company “executing the business model.” I offered that it sounded to me as if his company was going through the transition (the box in the middle) where it was starting to put in place the processes needed to build and execute the business model. I suggested that perhaps his first question shouldn’t be whether he needed an MBA. Rather the question he should be thinking of was: in which part of a company’s lifecycle did he think he wanted to spend the rest of his career? Did he enjoy the early chaotic stage of the startup? Was he fondly telling stories of how much better it was when the company was smaller? After the rocketship ride of this successful startup, did he now want to be a founder of his own startup? Or was he more comfortable now that there was more structure, repeatability and he was managing a staff? Was his goal to be a large company executive managing large groups of people? And if a larger company was his destination, did he want to manage complex technology projects or did he see himself in more general management in sales, marketing or finance? His vision about the trajectory of his career would answer what type of education he should get – and where he might get it. And who did he want to be? Where do you want to work: startups, mid-size or large companies? If large companies, what do you want do: engineering management or corporate management? If you find yourself debating the “startup versus large company” choice you’ve already chosen the big company. Entrepreneurship isn’t a career choice it’s a passion and obsession. As an entrepreneur one of the most satisfying feelings was having an idea that few thought was rational, viable, or the common wisdom and building it into a profitable company. Though it’s over a decade since I’ve done a startup, I had that feeling again over the last few weeks. 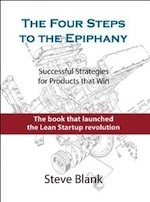 When I wrote the Four Steps to the Epiphany and invented the Customer Development process, my goal was to simply explain to myself what was broken in building a startup and propose an alternative path. The last few weeks have seen a flurry of Lean Startup conferences and presentations from companies actually using Customer Development to find a business model. It’s no longer a theory. And I found myself having the same kind of satisfied (and surprised) reaction. One of the key ideas of the Customer Development process was that many of the initial assumptions about your business model would probably be wrong, so it built in an iteration loop to fix them. This business model iteration loop – the Pivot is what makes startups agile and opportunistic. “Pivoting” is when you change a fundamental part of the business model. I learned something from all the companies that presented, but the one that made me smile the most was Xobni. Here were two 20-something founders with $12K in the bank who out of necessity became a Lean Startup and used customer and agile development. It’s not clear that if they had initially raised millions of dollars that they would have had a better result. Take a look at their presentation and see how they got to 5 million users. The Dropbox team also had a great story about pivoting and customer development. Watch the video of the Dropbox talk. Most startup business models are initially wrong. 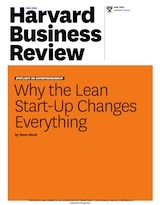 The process of iteration in search of the successful business model is called the Pivot. The speed at which you Pivot is inversely proportional to the amount of cash in your bank.